Otolemur Anterior temporalis Medial pterygoid AT+MP"
"AT + MP is a series of simultaneous stimulations of the anterior temporalis and medial pterygoid muscles. Figure 3. Eye movements during anterior temporalis and medial pterygoid stimulation. Schematics for the movements generated during anterior temporalis stimulation (A) in the Otolemur (left) and Felis subject 3 (right), and the medial pterygoid stimulation (B). The arrows indicate the directions of eye movements, the numbers are magnitudes (mean and, in parentheses, standard deviations). (Table 2). 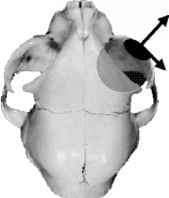 When the medial pterygoid was stimulated in isolation, the mean amount of protrusion was nearly 0.1 mm (Figure 3B, left). In Felis, anterior temporalis stimulation caused both protrusion and lateral displacement of the eye in subjects 1 and 3 (we do not have anterior temporalis data for subject 2) (Table 2, Figure 3A, right). The mean lateral displacement substantially exceeds the magnitude required to cause diplopia in Felis (see Table 1). Medial pterygoid stimulation caused both protrusion in subjects 1 and 3 (no data from the superior view camera for subject 2) and lateral displacement in all three subjects (Table 2). The mean lateral displacement for subject 2 was below the diplopia threshold, but the maximum displacement in this subject did exceed the estimated linear disparity threshold (Table 2). The mean lateral displacement exceeds the magnitude required to cause diplopia in two Felis subjects by nearly an order of magnitude. Displacement due to anterior temporalis stimulation as well as displacement and protrusion due to medial pterygoid are both responsible for disruptive-level eye movement magnitudes. Data for simultaneous anterior temporalis and medial pterygoid stimulations were not recorded in the cats. As these two muscles in isolation cause similar eye movements, it is unlikely that synchronous effects would cancel each other out.